Last month, I promised a Table of Contents for my multibiography on Deaf priests, and lo and behold, here it is. Of course, I’m still in the middle of my research, and book-writing itself will take place mostly in 2015. But I do have a plan. I welcome any and all feedback, especially from the Deaf community, on the titles I have here. As I journey through my long and wonder-filled trail of research, narratives are taking shape in my journal and smaller essay projects. Next weekend, I’ll finally get to interview Fr. 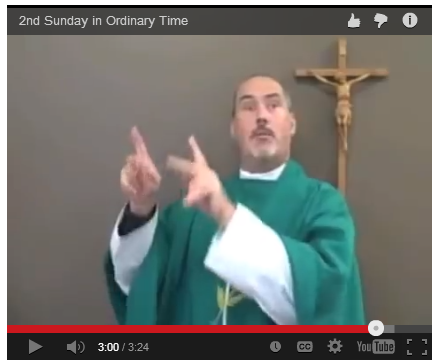 Mike Depcik, whose ASL vlog of Sunday Homilies is a model and inspiration for many signing preachers. I’m also organizing and developing archival research through an essential partnership with Fr. Joe Bruce, assistant to the Holy Cross archivist for the Deaf Catholic Archives in Worcester. U.S. Catholic Historian (CUA Press) has invited me to submit an article on “Sign Language and Deaf Ministry in America: 1949-2013.” I’m slowly writing that bit of history now, which covers the founding of the International Council of Deaf Catholics (ICDA) in 1949 and some stories of Deaf priestly vocations from that time forward. It’s very satisfying to be in the midst of this long project, getting to know all of these fine people and learning more about human language and especially Deaf spirituality and community.